The original underground bestseller on overcoming the hidden blocks to total wellness. Why do some people heal, while others don't? For more than 20 years, Caroline Myss has studied this question, working with thousands of patients as a medical intuitive. Now the author of the New York Times bestseller Anatomy of the Spirit shares the startling truth about the hidden barriers to healing on Why People Don't Heal. In association with Norman Shealy, MD (founder of the American Holistic Medical Association), Caroline Myss has developed a unique approach to the study of energy anatomy—the crucial energetic channels that connect mind and spirit. We do not heal, Myss observes, because we use our illnesses (or wounds) as a way of gaining intimacy and even personal power over others. This fascinating new look at the energetics of healing will teach you how to get out of the victim mentality that is the first obstacle to wellness. 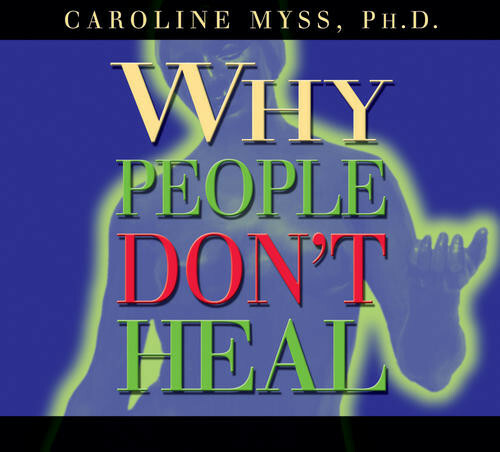 Presented by Caroline Myss in her own words, Why People Don't Heal is the perfect introduction to her groundbreaking work, and reveals the links between personal power and illness, toxic connections to the past, and much more. Although her message has been filtered a little over the years as she has moved further into the mainstream, Carolyn Myss stands out as a voice for the power of spirituality in human growth and healing. Whether you are seeking a Higher Power in recovery, the graces of an organized religion, or enlightenment and freedom from attachments, her insights will help you identify and move beyond the crippling impact of nursing a wounded ego on your perceptions of the world and relationships with others.